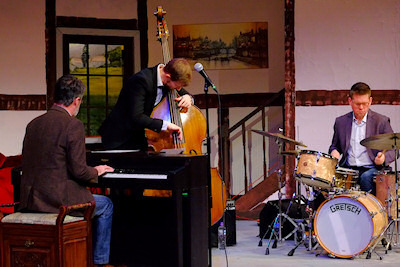 On Sunday afternoon the members of Newport Jazz Club were treated to a return visit by the David Newton Trio for an afternoon of more music from the big screen. Having composed for a number of movies David is no stranger to the big screen and with strong support from Matt Skelton (drums) and Tom Farmer (bass) a packed Apollo audience were treated to a feast of top class musical entertainment. Opening with a strong version of "Jeepers Creepers" followed by "The Shadow of your Smile" from The Sandpiper the stage was set for an afternoon of top class musical entertainment. Closing the concert with a superb rendition of "Get me to the Church on Time" the audience showed their well-deserved appreciation with a standing ovation. With a cd of movie tracks "Big Screen - Take 1" released in 2015 then a follow up is surely long overdue.